Learn how to tweak your Campaign settings to make sure you get most of your automated email outreach, then sit back and enjoy the results. After you've created a new campaign: configured steps, added People, reviewed templates, and everything is up to your standards, you need to finish your Campaign's setup with final settings. Specify your email account for sending emails by selecting one of the Email Accounts connected to your user account at Reply. Be aware that once you've specified an email account and started your campaign, you won't be able to change the email account for sending, unless it's an alias (server settings are the same). Set the limit of maximum first step emails, which means that your campaign won't send more Step 1 emails per day than this number. Set the delay between each email sent, which refers to the amount of time in seconds that should pass between sending one email to another. We recommend at least a 20-30 second delay to avoid your account being blocked for SPAM activity. Also, our system needs an additional 10-15 seconds to proceed with the email sending, so include this in your calculations when specifying the max number of first step emails per day. 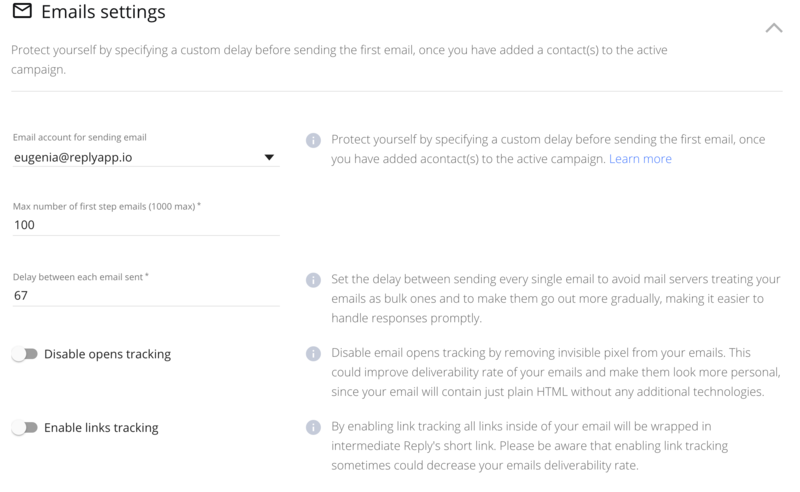 Disable opens tracking option removes the tracking pixel from the email sent via the campaign and emails will only be tracked by replies. Opens tracking is enabled by default. Enable links tracking is an option to track clicks on links within your emails sent to your prospects. It's disabled by default. The Finished state indicates that the campaign is over for certain prospects. The contact could be switched to the "Finished" state if a response is received, if their email bounced, if they opted out or if there was no reply after a certain number of days. You can set the system to call a prospect automatically after they open your email several times. You can also assign the Paused status to the prospect after a successful call. Specify which type of emails (first step or follow-up) are prioritized in case the campaign approaches sending limits. Specify the number of days within which a person must not have been reached out. Do not allow adding contacts to the campaign if they have already been contacted within a certain number of days. Save your settings and run your new campaign by clicking the Save and Launch button or just Save it if you are not yet ready to start sending emails. Another functionality available in the campaign settings is Calling prospects after a number of opens.